Supports and/or seals the thermowell into the process system. Threaded – One piece well with NPT threads (may require welding or brazing for seal). Flanged Welded – A primary J groove weld and a bevel groove secondary weld join the flange to the well. Flanges are made to specification. Lap Joint – Flanges are made to specification. Socket Weld – Fits A.S.A. standard socket weld couplings for field installation. Supports and/or seals the temperature sensor into the thermowell bore. Standard connection is a 1/2″ NPS thread. An optional brass or stainless steel captive cap is available for keeping the well bore clean when not in use. Straight – The outside diameter of the well is consistent over its immersion length. Reduced Diameter – The outside diameter at the end of the well is reduced for greater sensor sensitivity. Tapered – The outside diameter of the well decreases along the immersion length for greater stiffness. Is the distance along the shank from the end of the well to the underside of the process connection. Immersion length implies that this is the portion of the well that sees the fluid or gas that is being monitored. Care must be taken so that dead lengths (required lengths to pass through walls, pipe fittings, etc.) and proper sensitivity lengths (lengths required for proper temperature measurement of the sensor) are taken into account. 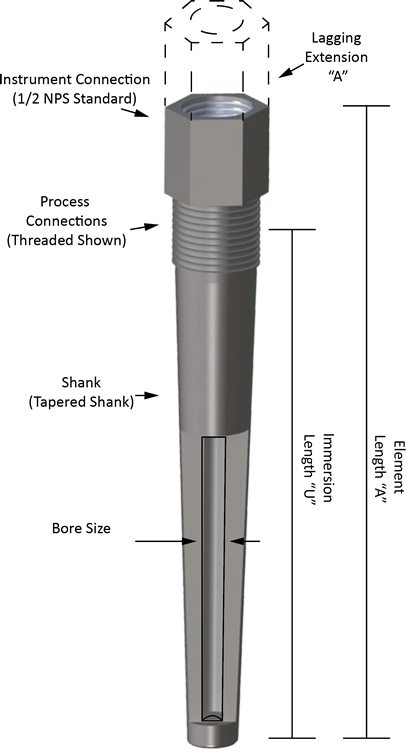 Is the distance along the shank from the top side of the process connection to the termination connection of the well. If needed, dead lengths (i.e., that required to pass through walls, pipe fittings, etc.) should be taken into account. For special thermowells please send your prints and/or specifications. Marlin will promptly quote your price and delivery.